Home»Blog»Make BackWPup»BackWPup 3.6 with Encryption feature released! BackWPup 3.6 with Encryption feature released! 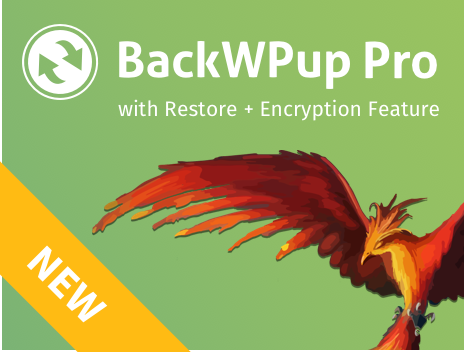 BackWPup 3.6 with encryption functionality is finally available for Pro users! We had already anticipated it in the previous release, and now it is possible to encrypt backup archives quickly and securely: in this way you safely save your personal data and all the informations of your site. If you think that data protection is not a priority for you, do not forget that for the new European General Data Protection Regulation (GDPR) this is an essential requirement that must be met to avoid unathorized access to sensitive data. To find out more, take a look at the following post: https://inpsyde.com/en/wordpress-backup-plugin-gdpr-compliant/. However, do not worry: with BackWPup your archives are protected and according to law! Encryption Release Special Offer: until June 22nd, 2018 you can get the new Pro version with a 20% discount! When we talk about cryptography we refer to well-known and widely used algorithms to protect computer data that, through the use of a secret information (the key), can transform our backup archives into an unreadable format, thus protecting the data itself from unauthorized access: data privacy is thus guaranteed and the GDPR respected. In the same way, we can reverse the process: that is, the same algorithms used to make our information unreadable, with the appropriate key, can bring the data back to its original state, thus making it accessible. Of course this is only possible if you have the key. So the secretness of the key is a fundamental element because the data remain safe. The main cryptographic techniques are of two types: the symmetric one that uses only one key and offers an excellent level of security; the asymmetrical one that uses two keys and offers a higher level of protection, but at the expense of greater processing complexity. BackWPup offers two distinct solutions based on the two types of cryptography: the user can quickly and intuitively choose which method to adopt for each backup archive that he/she intends to protect. In the symmetrical case the key will be managed by the plugin itself, saved in the settings. In the asymmetrical case one of the two keys will be entrusted to the user who must keep it in a safe place. This point requires caution: losing a key, deleting the settings or simply storing it in an unsafe place will make it impossible to restore data previously encrypted with that key to anyone on the planet. Archives can be anywhere: BackWPup encryption is by our side! Did you understand how it works? Then we have a new power in our hands: the backup archives, once encrypted, can be stored anywhere because the encrypted data are not accessible! And BackWPup is therefore able to integrate the functions of encryption and decryption with its normal backup storage managment process: so even when the backups are created to the external destinations that the Pro version provides (Google Drive, Amazon S3, Dropbox, FTP server, etc.) the encryption and decryption techniques are automatically applied by BackWPup without the user having to perform further steps. Great! Have you find a bug in BackWPup? Please let us know over at Github. Do you need support for the free plugin? Please post on our support forum on wordpress.org. We do our best to answer all questions quickly. Don’t forget: until June 22nd, 2018 you can have the Pro version with 20% discount!